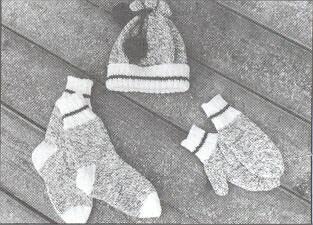 eweCanknit knitting pattern #116: small clothes. Children's sizes 2-12. Uses DP needles and worsted weight yarn. Fits head sizes 9-22 inches. Foot length 6.5-9 inches. Width around palm of hand 4.5 to 6.5 inches.